With any popular new device that hits the market, it’s not too long before there are products developed to support it. The iPod hadn’t been out but a few weeks before cases, armbands, and the like were on shelves and websites everywhere. Likewise, the iPhone prompted a bewildering array of cases, battery packs, stands, charging solutions, and screen covers. The iPad ecosystem, barely a few weeks old, is also starting to grow beyond software and bags. Today, the store I work in got the Griffin A-Frame stand, and sold through half our inventory in just a few hours. I decided to buy one for myself before they were all gone. The hardest part of the day was leaving it in my bag until I could get it home and put it through it’s paces. Let’s see what it’s made of. I love that the total packaging is two folded and tabbed pieces of heavy paper. No glue, plastic, heat-sealed coffins or Styrofoam. Thanks, Griffin! 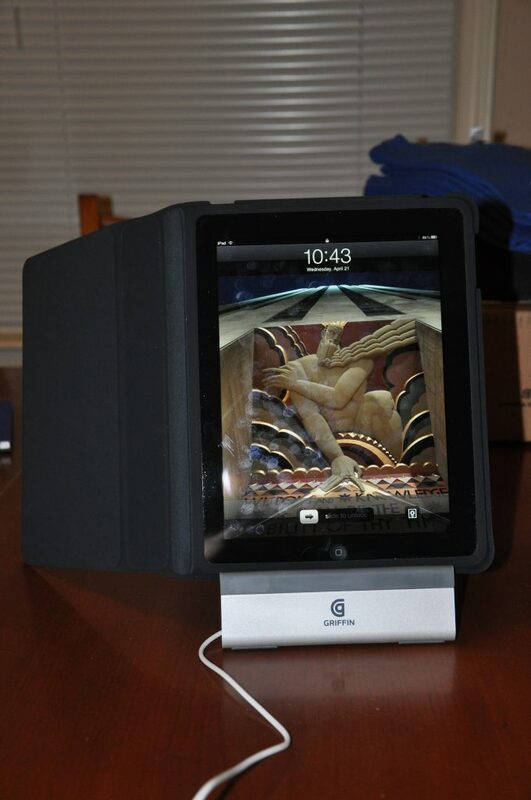 With the charge/sync cable attached and the case cover open, the iPad is still secure in the A-Frame stand. 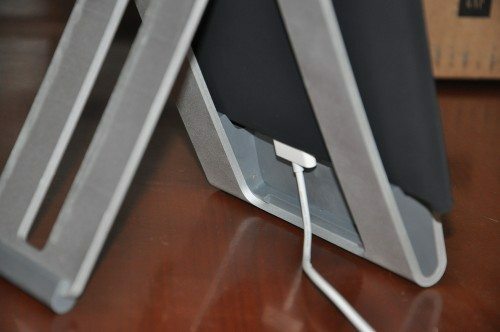 The iPad's charge/sync cable fits under the cut-out without compromising the cord at all. 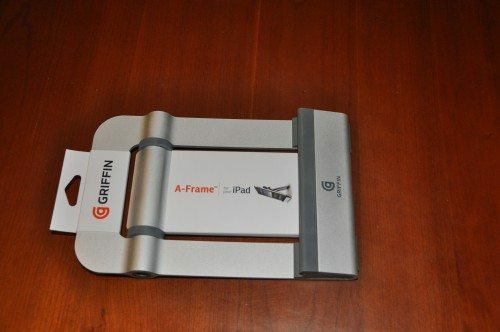 The Griffin A-Frame is also designed with a clever hollowed-out space under the center base which easily allows an iPad changing cable to be attached while it’s in portrait orientation. When the back leg is folded flat for travel or low-angle use, it fits flush into this area. Even with the iPad case locked in low-profile mode, the A-Frame holds it steadily. The build quality and finish perfectly match the current Apple design for their products. Whether you’re sitting this by itself at a coffee shop, on your kitchen or coffee table for watching video, or on a desk for composing text, the stand, like the iPad itself, fades into the background and just does what you expect without any hassles. The friction hinge holds the leg at any angle within the range, and the soft rubber takes any worry about scratches completely out of mind. My only thought is pondering how I’ll carry this if I leave home with it. The edges are quite severe, so I’m going to have to find a bag of some sort to protect other items from it while on the go. But when it’s out in use, there are no worries at all. It is stable, tightly constructed, and sits gracefully in any location. At $50, it may seem a little pricey, but for the quality and peace of mind it gives, it can sit alongside my MacBookPro (on it’s similarly constructed Griffin Elevator stand) with no problem. I need one too….Just need to get the iPad first! I bought one of these from the Griffin website, sight unseen. I haven’t used it, yet, because my 3G iPad has not yet arrived! My first impression, though, was of the A-Frame’s weight: it is one *heavy* thing. The A-Frame probably weighs nearly as much as the iPad itself. Therefore, I cannot imagine carrying it around as a portable stand. But for a desktop (and relatively stationary) stand, I think it will shine. What does this do that a Fellowes Study Stand (currently $4.99 on Buy.com) does not? Okay, look much cooler, check, but is that worth the $45 premium? I usually love Griffin products but this stand seems to fail in one important area. The iPad can be used in either the horizontal or vertical orientation. The A-Frame seems (I could be wrong looking at the pictures) to only work for the vertical orientation. There are plenty of reasons to both type and view/read the screen in a horizontal position. The A-Frame is useless without that ability. I shot a couple of photos in portrait orientation, but didn’t include one in the review. I probably should have, but until I edit the post to include it, trust me that it works very well in landscape, with or without a charge/sync cable attached. 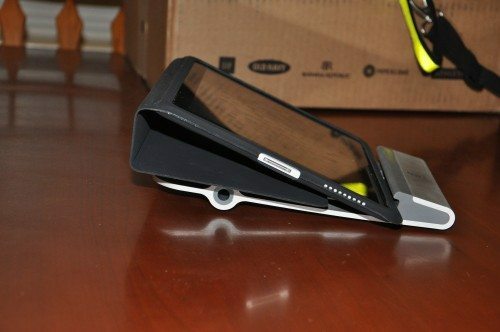 Sandee, if you go to Griffin’s site you’ll see pics of the stand used in horizontal mode – and if you look closely at the last pic in this review you’ll see it’s in horizontal mode there as well. Thank you for correcting me. Now I’m quite impressed with the product, as I usually am with Griffin products. Do you think the iPad would still fix on the frame if it was inside a Belkin Grip Vue case? @Glenn – It would in landscape, but I don’t think it will in portrait. I’ll try it if I remember tomorrow. We use iPads in the grip view case to check folks in for appointments. If folks aren’t familiar with the Grip View, it’s a cover for the back of the iPad that has raised handles on the back on the narrow sides. It’s great if you’re using an app that works well in landscape orientation. @Smythe Glenn might be asking about the new clear Belkin Grip Vue case I recently reviewed. They sell them at the Apple stores and online. They don’t have handles, so they’d have a better chance fitting in the Griffin stand. ( http://goincase.com/products/detail/grip-protective-cover-cl56430 ), which we use and does have handles molded into the short edges of the rear of the iPad. I don’t have any experience with the Belkin model of similar name. Thanks for the great review Smythe! If you guys are concerned with the price, we usually have coupon codes posted on our Facebook page. Become a fan and click “Home” and you’ll see them. Will the stand accommodate the iPad safely if its in an indestructible hard case?